Guilt and grief are central to Grace Fox’s film Serpentine set in a coastal community. We chatted about collaborative filmmaking, colour palettes and bagging top actors. D&CFilm: The idea of Serpentine seems emotionally and mentally intense – where did it come from? Grace Fox: Serpentine is a film that tackles love, loss and grief. We see a wife’s love and concern for her husband, and a husband struggling with a guilt he can’t bare to face. He represses his emotions and consequently falls into the path of his own undoing. The idea for the film actually came to me whilst I was on holiday by the coast. After seeing real life fishermen working on their boats, I wondered what it would be like for a fisherman, who lives and breathes life on the water, to develop a fear of the sea resulting in an inability to work. These were the essential fundamentals and starting points for the film. Me and my co-writer then spent the next month or so developing a solid storyline, one where we saw the main protagonist enter unfamiliar territory with his world falling to pieces. D&CFilm: Were there any films or styles that inspired your making of Serpentine? Grace Fox: Serpentine was an idea that just popped into my head. There weren’t any films that stood out as major inspirations, but it was through ITV’s Doc Martin, where I found inspiration for Serpentine’s main character, Tom – a Cornish fisherman. 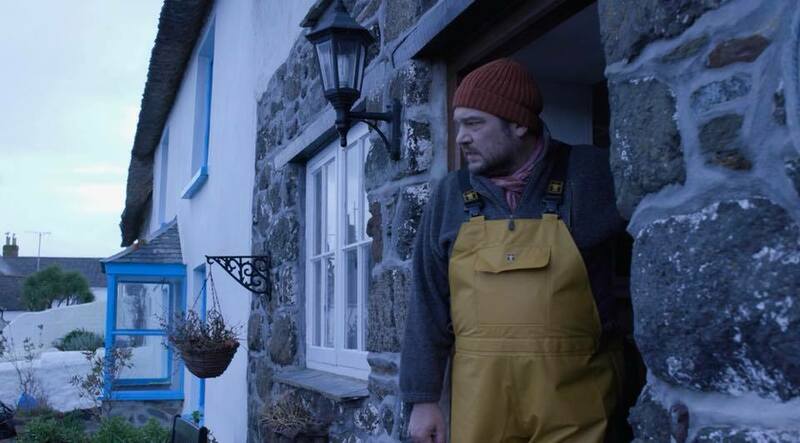 In the TV show, there is a fisherman character named Chippy Miller played by Rory Wilton. After seeing Rory in his yellow fisherman’s gear, I just knew that he was perfect for the role of Tom. A vision for the film, was to produce cinematic and visually striking imagery to convey the problems that the character’s are facing. I knew from the start of this project, that I wanted the film to have a cold colour palette which would work in helping to convey how the main character sees his world – dark and dull, a world without hope. As well as striking imagery, music was also an important character within the film. I wanted a poignant sound score where the melodies and chilling chord progressions haunt the character further giving the film a foreboding sense of mystery. D&CFilm: Serpentine is ‘your second collaborative group film’. Can you tell us more about your collaboration as a filmmaking team? What was the first film you made, and what are the similarities / differences in themes with it and Serpentine? Grace Fox: Serpentine was a wonderfully insightful and valuable experience for both myself and my crew. As university students, it was our first time working together on a big set with professional actors. Our previous collaborative group film was a very small production that was shot in Madrid, Spain. It was an adventure film that was inspired in some ways by the Indiana Jones films. Both films tackle love, loss and family, but Serpentine deals with these themes in a more emotionally stimulating way. I guess one of the biggest differences between our first film and our second, was the way in which both projects were approached. We were naive on our first project, we still had a lot to learn about filmmaking. We all just thought it was cool to make a film. Serpentine, however, was shot almost a year later which was enough time for us, as a group, to discover our individual specialities and apply them where necessary. Serpentine really opened me to the world of filmmaking and has truly ignited my passion for directing. I learnt a lot from the film in all its production stages and it’s these essential skills that I can now take forward and develop further in my future projects. D&CFilm: How did you get the cast? Grace Fox: From the start of the project, I knew that I wanted Rory Wilton to play the main role of Tom. The role was written for him, so I wanted to ask him first before offering the role to anyone else. Although initially going to his agent first, I actually reached out to Rory on social media. I sent him a message detailing a bit about the film and asked if he would be interested in the role. He was and I guess the rest is history. Emma Spurgin Hussey, who plays Tom’s wife Carol, in the film, just happens to be Rory’s partner and is also an actress, so I asked if she would also be interested in the film and was delighted when she said yes. Both Rory and Emma are great actors to work with and since doing Serpentine, have worked with me on several other projects, including my next film which is currently in development. D&CFilm: Shooting by the seaside in winter sounds like it could be fraught with problems. I’m thinking of weather, primarily. Where did you film and how did it go? Grace Fox: We shot Serpentine over the course of three days at the start of February this year. The film was shot on location in the beautiful fishing village of Coverack in Cornwall and from what I can remember, we had pretty good weatherfor that time of year. It was cold, very cold, and at one stage it did snow (although it came to nothing), but apart from that, I can’t remember there being any real issues where the weather might have halted production. We were very fortunate that we had the use of a beautiful thatched cottage which acted as the home of the two main characters. The cottage also acted as a base – a place we could go to keep warm. We actually spent a lot of time in the cottage as that was where most of the films dialogue took place. There were some concerns during the pre-production stage about recording dialogue outside, especially by the seaside as the weather can often be turbulent. To rule out any wind interference, myself and my co-writer, designed the script so that the most heavy dialogue would take place inside where clean sound could be captured. Overall, we had a great time shooting by the sea and were very lucky as a few weeks later, storms hit Coverack. D&CFilm: A sneaky peak on Twitter says you’re in discussions with Emma Spurgin Hussey about your next film project. Is there anymore you can tell us? Grace Fox: It’s still early days regarding my next project, although you’ll probably hear some stuff on social media within the next couple of weeks, so keep your eyes peeled. Let’s just say that my next film will probably be my biggest challenge yet and will again star Rory Wilton and Emma Spurgin Hussey. I’m looking forward to working with some great people, some new faces and of course, my wonderful crew, whom I couldn’t do my work without. D&CFilm: Thanks Grace! We’ll keep our eyes peeled! Serpentine will be screening at the Cornwall Film Festival on November 10 at 10am in The Poly. Get your tickets! The film will also be screening at the Two Short Nights Film Festival on November 30. Get your tickets. The Two Short Nights Local Talent encore screening is at the Exeter Phoenix on Sunday, December 16 at 1pm – read our round-up. Get your tickets on the Exeter Phoenix site.